San Antonio came out strong following last night’s big win in the Alamo City, and while there was some back and forth, Texas never led in the contest and ultimately fell 4-3 at home to the Rampage. Laxdal also pointed to the lack of luck that Texas seems to be getting when mistakes are made. “We seem to make mistakes defensively and pay the price for it,” he said, as opposed to occasionally getting a big save from the goalie or a missed execution from the opposition. The Stars were being outshot 6-0 to start the game. Adam Musil went first for the Rampage, a backhanded goal from the hashes after a paunchy rebound came out to him and Gurianov didn’t have the backcheck to pick it up. A Texas power play would even things up quickly thereafter. Erik Condra potted his sixth of the year right on the doorstep. It wouldn’t last long as San Antonio reclaimed their lead to close the first period. Nolan Stevens, aided by a power play that had only just ended, whipped one past Philippe Desrosiers, a goal he probably should have had, to close at 2-1 for the first. The power play was kind to Texas again to start the second period. Justin Dowling was left entirely unmarked just above the hashes, and Joel L’Esperance found him alone for his second primary assist of the night. Tyler Wotherspoon and Austin Poganski reclaimed and extended the Rampage lead within five minutes of the Dowling goal. Wotherspoon’s was a laser of a point shot to make it 3-2. Poganski collected a rebound on the power play for the 4-2 score, a backdoor play that Niklas Hansson should have picked up. Texas would make it interesting late with Erik Condra’s second of the night, a power play goal rebounded past Ville Husso. 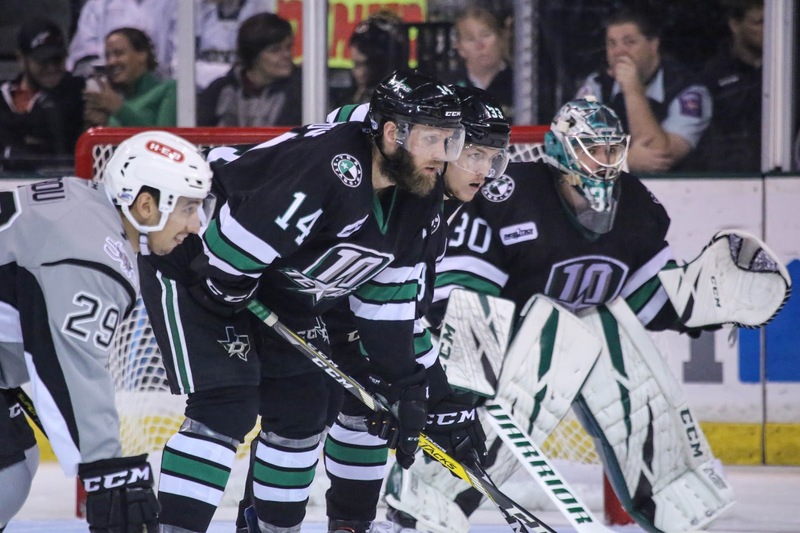 The Stars would pull Desrosiers with under two minutes remaining, but nothing would come of it. Texas attempts to collect some points on the weekend with the final contest of the 3-in-3 tomorrow in San Antonio at 3 PM. They may be without Ben Gleason in the contest as Laxdal noted he could be out with a lower body injury tomorrow.